The Peoples Water Board is coalition of organizations (labor, social justice, environmental, conservation) working together to protect our water from pollution, high water rates, and privatization. 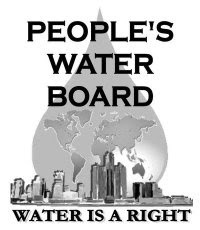 The Peoples Water Board holds its meeting the second Tuesday of the month at the Cass Corridor Commons at 4605 Cass Ave. at 5:30pm. Enter off of Forest.